James stands for Java Apache Mail Enterprise Server! It has a modular architecture based on a rich set of modern and efficient components which provides at the end complete, stable, secure and extendable Mail Servers running on the JVM. Create your own personal solution of emails treatment by assembling the components you need thanks to the Inversion of Control mail platform offered and go further customizing filtering and routing rules using James Mailet Container. Running on Java 6 onwards and on the JVM. Some optional components might require Java 8. 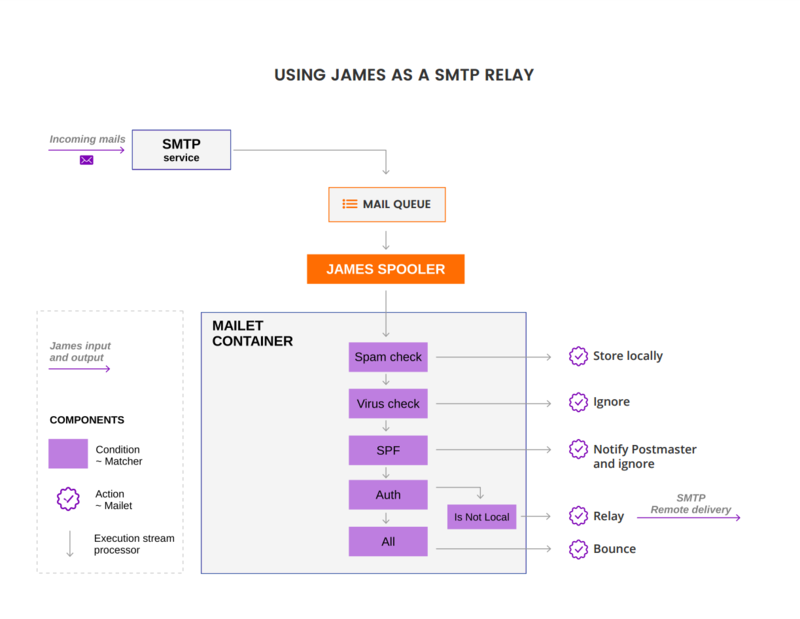 Your James server can also be used as Mail Transfer Agent, by enabling only SMTP or as a IMAP Mail Delivery Agent. James is a living Open Source project (all developments and implementations are based on open technical standards), any function which is not already available from can be developed! Here you will try James server v 3.3.0 thanks to an image.This James image has a default configuration using JPA (hsqldb) and Lucene. It also includes a default domain named james.local and three default users: user01, user02, user03, with their default password being 1234. 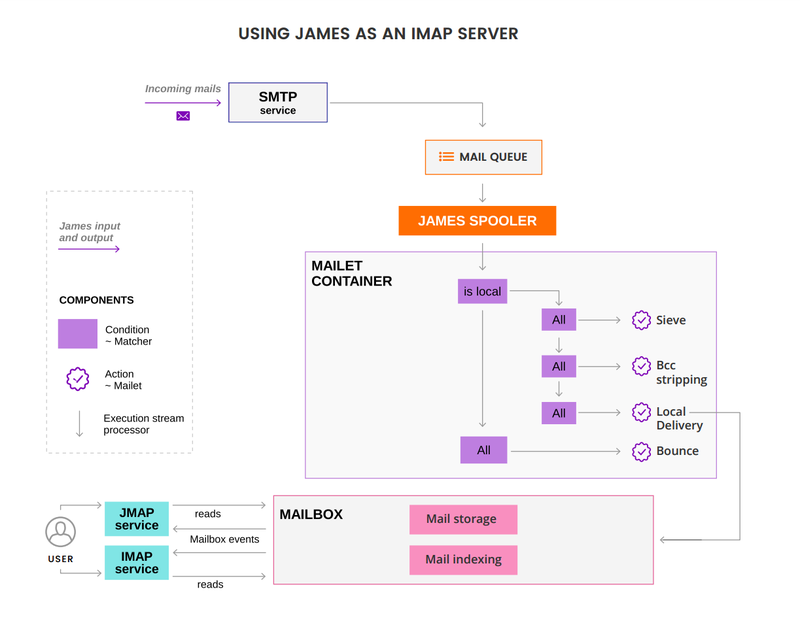 Note: this James server will respond to IMAP port 143 and SMTP port 25. Then, connect this image with for instance, Thunderbird. Notes: for more information about James CLI, have a look at 'Useful commands section README.txt'. 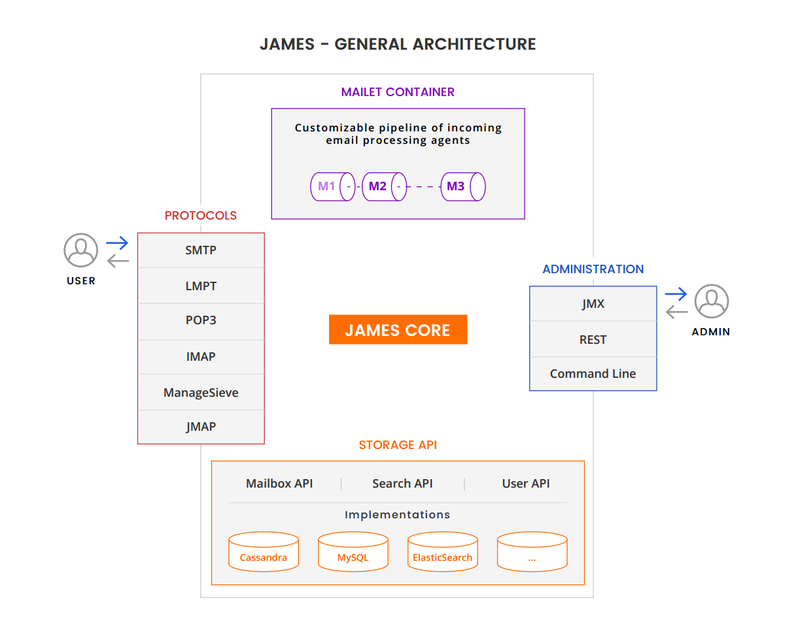 The Apache James developers are pleased to announce James server 3.3.0 release. James Mime4J 0.8.2 has been released. Apache James Project is an Open Source all-volunteer project obtaining its strength from its Community made of developers and users. All are welcome to the Community! That way, we recommend that Users, Developers, Curious and Fans join the James Community. Subscribe to the appropriate Mailing Lists according to your interests and your profile. Mail guidelines explain you more precisely how it works. Chat in live with the community on Gitter chat room. Express yourself and follow us @ApacheJames. Our download page allows you to download artifacts and sources for the James Server and James libraries. Find a list of companies which can provide you some support on James. James is a project that lives from the contributions of its community. Anyone can contribute! That's right, we always want to hear from people with contributions to the code, the documentation, the website, and bug reports. We more than welcome non-coding contributions. We more than welcome articles and blog posts about James. Contact us by email or on Gitter to share your experiences. Don't hesitate to promote the Apache James project on your preferred medias. Each subproject has its own bug tracker. Go to James Server project bugtracker. For other projects click on the appropriate links mentioned in the concerned subproject. Finally, create your issue. Documentation is an easy way to get on board! Check out the ~documentation label on JIRA to get some ideas. Report on JIRA the typo you spots, the information you miss, and any improvement you can think to. The next step is to contribute the documentation changes via Git. Read our sources from the Apache Git. You can also come and interact with us on GitHub and share your work by creating a pull request. Alternatively, you can attach a patch to the JIRA issue. After a review, and exchanges with you, an Apache James developer will integrate the changes once it matches our policies. Additional ideas are more than welcome. Don't hesitate to discuss that with us! Security: Vulnerabilities should be announced to the Apache Security team. PMCs will be notified about them, and will work hard to propose fixes as fast as possible. The contribute page contains more details about the various details exposed above. To match the quality expectations of our community, we enforce coding standards. We rely on checkstyle for style checking. Our deployment currently allows serving a hundred users over JMAP, SMTP and IMAP.